As you know, Heat is one of my all time favorite movies. So I was absolutely heartbroken to see that an Academy anniversary screening premiere of a new 4K restoration with writer/director Michael Mann and stars Al Pacino and Robert DeNiro attending came out of nowhere and sold out instantly. As someone who has attended so many awesome screenings and now put on my own special events, missing this seemed like a punch in the gut. A near meeting Jean-Claude Van Damme level of VienDammage influence. Not enough of a punch to go line up hours ahead of time to try and stand by but you know what I mean. But some eagle eyed #MovieBros alerted me that a block of tickets had gone back on sale, probably from Academy members who had to cancel. 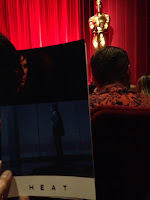 I quickly swooped up a pair for a cool $10 bucks, informed my other Heat loving friends and before you knew it, we had near front row seats at the Academy's theater in Beverly Hills. 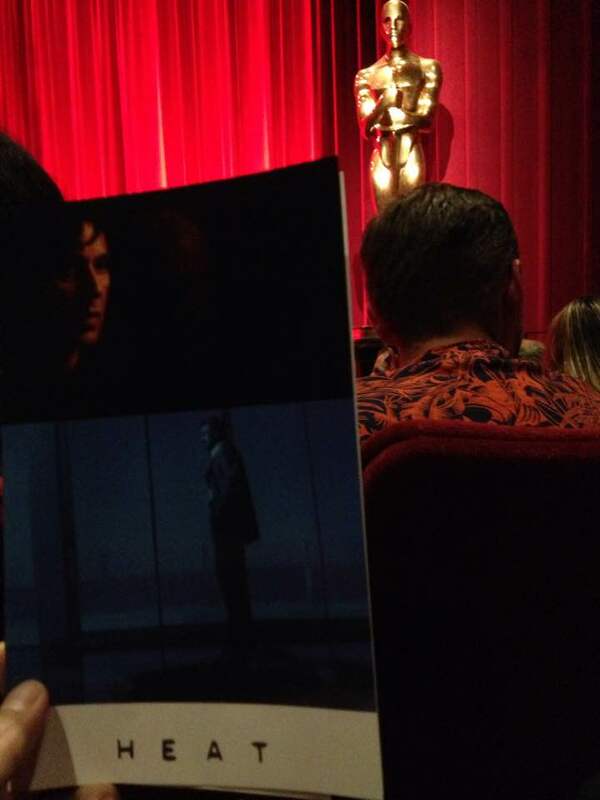 The evening's program exploded with names added to the night like Val Kilmer, Diane Venora, Mykelti Williamson, editor William Goldenberg, producer Art Linson, director of photography Dante Spinottie and many more. I think there were 12-15 guests on stage by the end of the night. The movie, about highly skilled and experienced thieves and detectives still plays incredibly. At 3 hours long we get all the twists and turns of both professional crews yet I could keep watching another 3 hours. 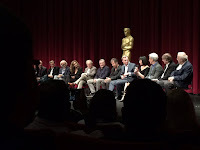 Everyone in the cast is immaculate but it's Pacino's quiet then screaming Detective Hanna that is just so Damme memorable. During the Q&A, Pacino shared that it was a secret that his character chipped cocaine which lead to some of his hilarious outbursts. Christopher Nolan is an open worshiper of the film, just watch The Dark Knight if you need evidence, and more or less fanboy'd out as moderator talking technical aspects with Mann, who in turn rattled off the exact number of shooting days and locations with no hesitation. 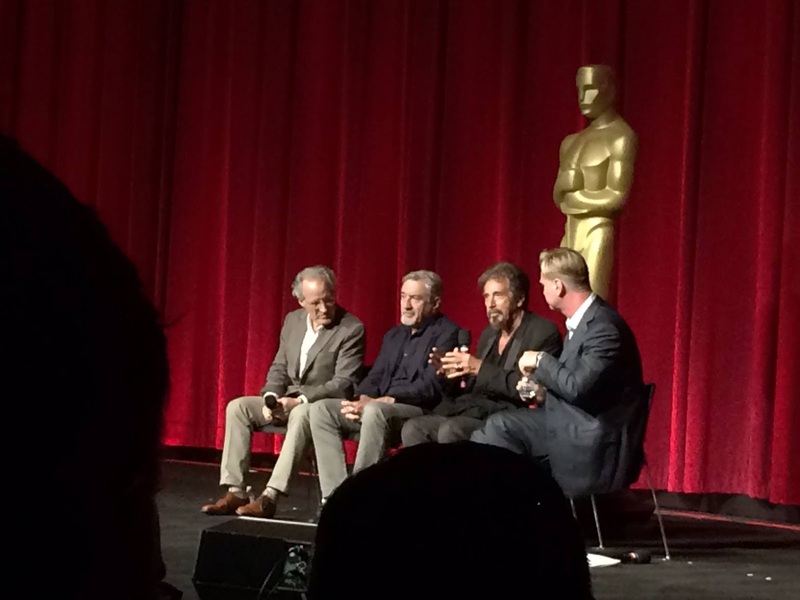 This is the second time we've seen Pacino and he was a riot as usual but he needed a little warming up. DeNiro didn't help as he literally is his cold and quiet onscreen persona and just shrugged about getting involved with the film basically thinking it would be great based off Mann's script and previous work. 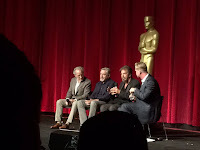 After a bit of reminiscing from the rest of the panel, Pacino started to remember more and in one story, he and Mann thought Williamson, hot off of Forest Gump should have won an Oscar but didn't, so they paid out of pocket to get him in their film. Pacino also delivered the greatest line of the night and possibly of the quarter when he summed up getting involved with the film as "it's New Year's Eve, I want to get into something...". Val Kilmer was a surprise, after years of battling throat cancer rumors and weight loss, he looks slim but in good spirits but when he started talking, it sounded like he was doing a Marlon Brando impression as he was fighting a swollen tongue. Walking out I spotted co-star William Fichter and chit chatted with Danny Trejo and wondered where Tom Sizemore was. A movie magical night.